Written by George Wolff (University of Liverpool) with help from Tim Jickells (UEA), Mike Krom (University of Leeds) and Martin Preston (University of Liverpool). Roy Chester, Professor of Oceanography in the Department of Earth Sciences from 1991 to 2001 died on the 20th March 2018 after a short illness, aged 81. Roy graduated with BSc in Geology in 1959 and was then awarded an Imperial Oil Company Scholarship for research into sedimentary geochemistry and gained his PhD in Manchester in 1963. 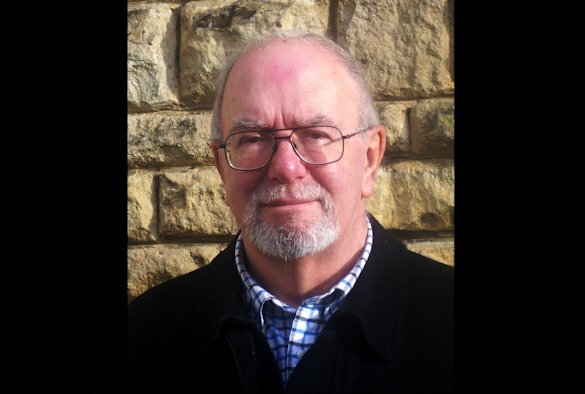 In 1962 he came to Liverpool as an Assistant Lecturer in the Department of Oceanography, being promoted to Lecturer in 1965, Senior Lecturer in 1973, Reader in 1976 and Professor in 1987. He took over the established Chair of Oceanography from Professor John Riley in 1989. Roy had many research interests in the geochemistry of marine and lacustrine waters, sediments and the marine aerosol. He published over 125 research papers, many of which were very highly cited. Roy started research working on deep-sea sediments in the early 1970s and then, recognising the role of atmospheric deposition in supplying the terrigenous clays to the abyssal sediments, began a series of pioneering studies of atmospheric inputs to the ocean. His innovative work helped to create the whole field of research on atmospheric inputs to the oceans. He developed a novel sampler and his early work (with Harry Elderfield, FRS and others) on the Saharan dust plume set the scene for much that followed in this field. He first considered the clay content of aerosols, but an important component of his research was his pioneering work on atmospheric particulate matter including Saharan Dust as an external source of trace metals and other chemical species to the Mediterranean Sea (with Peter Statham, Malcolm Nimmo and others). Scientists realised that there had to be major amounts of Saharan dust impinging on the adjacent Mediterranean, but there were almost no measurements of the nature and amount of such inputs. Roy collected samples from some fixed stations in the Western Mediterranean and during cruises through the Mediterranean. He made measurements of total and leachable trace metals, determining for the first time the nature of the major sources of trace metals to this important inland sea and the relative amounts of supply from Europe and from Saharan Africa. His novel methods of determining the solid-state speciation of trace metals were also important in the understanding of their solubility and biogeochemical impact in the oceans. Roy went on to show the important contributions of continental dust to the Atlantic Ocean. The significance of his work was not just in understanding how these transport pathways operate, but also in the realisation that the continental aerosol could be an important supply of nano-nutrients, such as iron to fertilizing oceanic surface waters. The trace metal fertilization of the oceans remains a very active area of research and Roy would have been delighted that colleagues at the University of Liverpool continue to excel in this field. As a teacher, Roy Chester was a firm believer in the principle of allowing cutting edge research to influence teaching. His collaboration with John Riley and Geoffrey Skirrow initially resulted in the research level two-volume book on Chemical Oceanography published in 1965, but realising that this was beyond the reach of undergraduates, he and Riley distilled the key components into the “Introduction to Marine Chemistry” published in 1971. This was a key resource for the BSc teaching at Liverpool for many years and was widely adopted internationally as an accessible and authoritative overview of the subject. Through his research and teaching Roy developed his description of the oceans as a unified system linked by a variety of pathways. He used this approach to develop his magnum opus textbook “Marine Geochemistry”, which ran for three editions (the third with Tim Jickells) and is still one of the most comprehensive and well-written marine chemistry textbooks to this day. Roy was keen to maintain its relevance and was talking to Tim Jickells about another edition only a few months before he died. I remember Roy as an excellent colleague with a wonderful sense of humour. He led the Oceanographers through some difficult times but cared for all of the staff and was prepared to stand up for us when necessary. His PhD students and Post-doctoral researchers benefitted from his careful and close supervision. Many of them were international students, and now hold academic posts all over the world. Roy had more strings to his bow than most. He was a prolific novelist penning murder mystery and thrillers including “The Toy Breaker”, “Pagan” and “Vengeance”, a member of the Mental Health Tribunal and an active member of the Round Table. He was also a mad Liverpool fan, who never tired of ribbing me about my support for West Ham United F.C. and delighting in the inevitable thrashing that we got every season at Anfield! I missed Roy when he retired and will certainly miss him now. 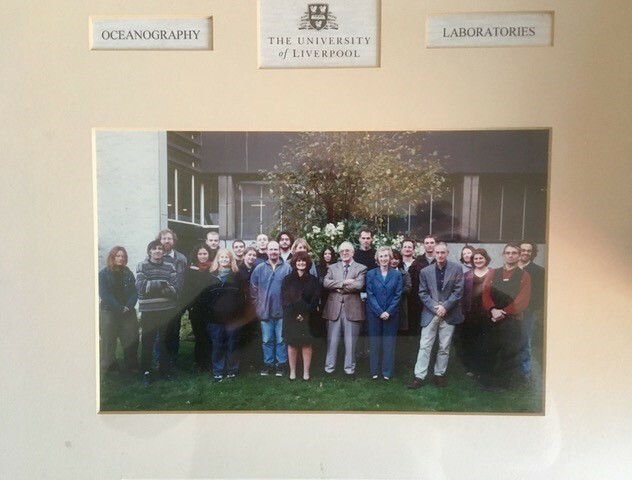 Department of Earth Sciences, circa 2000.